Have an awesome Monday, everyone. I realize I sound jaded – that’s because I am jaded. I’m also a realist. This world continues to disappoint me and you only have to open your eyes and pay attention to what people are doing, what they’re talking about, or what they value most, to see what I mean. God? Belongs to Jesus freaks and doesn’t exist – just look at the state of my life, how can an entity that touts love allow me to live like this? Too many people subscribe to the influences surrounding them. Too many people do not take the time (or have simply never been taught to think for themselves – which opens up a whole different can of worms), to question what is being spoon fed them. Does it make sense? What’s the source? Is it biased information? What’s the flip-side to that story – because there are always two sides to a given story. I get so tired of people subscribing to one train of thought, or belief. No one is 100% right – ever. I certainly don’t have all of the answers, but I like to think I’m smart enough to pause and consider all angles before coming to my own conclusion. Many people do not do that. They are simply content to listen/watch/read what is being presented to them and BAM – it must be true. Every last biased morsel. I wish I had faith in people – I wish I could say, with even a small percentage of confidence, that people can change, that things will get better. But honestly, I think we’re past that point of no return. We have more takers than givers. That was proven with the re-election of the biggest socialist president in history. Little by little, inch by inch, drop by drop, governments both in America and in Europe began taking more and more from people, diminishing the incentive of those on both sides of the transaction — the taker and the giver. In America, nearly half of wage earners pay not one single dime in federal income taxes. Many of them trudge down to the local polling place or vote via absentee ballot — and vote themselves a raise. So no. I don’t subscribe to just anything, or anyone. I’m independent, out spoken, and stubborn enough to dig my heels in and fight every last attempt to conform me to anything. (Well. That was a rather heavy post. Sorry about that. I guess I’m more disillusioned than I thought). 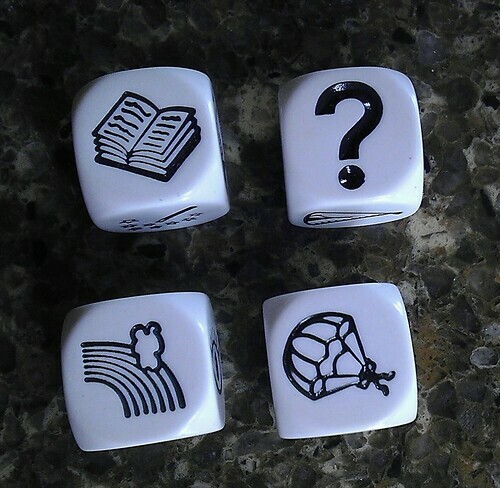 I throw down some dice and you write a short story (minimum 500 / maximum 1000 words) using a combination of the dice below. THE CHALLENGE: The story must contain the line: “My life is an open book”. A supporting character bombards the main character with uncomfortable questions. The main character is an optimist and he/she likes to take chances in life. Leave a link to your story in the comment section, if you wish. (If you would like to keep track of just the Story Cube prompts, subscribe to this feed: https://writefromkaren.com/category/writing-stuff/picture-fiction/). So I haven’t posted any crafting posts lately, and they seem to be popular, judging by my stats (not that I keep track of my stats but they are fun to look at once in a while). Please note – I’m simply sharing the crafts that have caught my eye and ones I would totally do if I were one: not lazy and two: had small children again. Since I AM lazy and I DON’T have small children anymore, all I can do is browse through the various crafts and share the ones I like the most with you. Just because I don’t actually DO these crafts doesn’t mean I can’t appreciate the creativity, right? At any rate, please enjoy. And you can find so much more at Spoonful.com. Merida’s three suitors never stood a chance at winning her affection with their pitiful archery skills. But, had any of them presented the feisty Scottish princess with one of these lovely heart-shaped pendants, there’s no telling where the story may have led. Right before Tinkerbell accompanies the other fairies to the mainland, Terrance hands her a little pouch filled with magic Pixie Dust to tide her over while she’s gone. Decorated with stick-on felt hearts, one of these enchanting pouches makes a sweet gift for your child to give to a special friend — it’s the perfect size for packing valentine candies and trinkets. This Valentine’s Day, your little princess can serenade her valentine with a sweet songbird made of paper hearts. These arrows from Cupid’s quiver may not have any supernatural effects, but that doesn’t make them any less fun to share. Your kid will be a hero when he hands out these supertreats. Hello lunch hour, meet my life saver.